Nine of the 16 Americans on the schedule on Wimbledon's opening day won their matches, with the men going 3-1 and the women 6-6. Top seed Serena Williams defeated Margarita Gasparyan of Russia 6-4, 6-1 and sister Venus, the No. 16 seed, overwhelmed Madison Brengle 6-0, 6-0. Qualifier Bethanie Mattek-Sands beat Alison Van Uytvanck of Belgium 6-3, 6-2, CoCo Vandeweghe downed Anna Karolina Schmiedlova of Slovakia 6-4, 6-2, and Lauren Davis defeated Polona Hercog of Slovenia 6-4, 7-6(3). Sloane Stephens was the only unseeded American facing a seed today, and she came through over No. 27 Barbora Strycova of the Czech Republic 6-4, 6-2. Alison Riske, Nicole Gibbs, Shelby Rogers, Edina Gallovits-Hall and Irina Falconi lost their opening matches today. Four US women are on Tuesday's schedule are: Varvara Lepchenko vs. No. 20 seed Garbine Muguruza of Spain, Christina McHale vs. Johanna Larsson of Sweden, qualifier Sachia Vickery vs. No. 8 seed Ekaterina Makarova of Russiaand No. 21 seed Madison Keys vs. Stefanie Voegele of Switzerland. No. 17 seed John Isner picked up a straight set win over Go Soeda of Japan 7-6(5), 6-4, 6-4, while Steve Johnson and wild card Denis Kudla needed five sets to advance. Johnson defeated Lukas Lacko of Slovakia 6-3, 6-7(5), 4-6, 6-1, 6-4 and Kudla made an even more dramatic recovery, beating Pablo Cuevas of Uruguay 6-7(4), 4-6, 6-3, 6-2, 6-2. Donald Young lost his match to Marcos Baghdatis of Cyprus 5-7, 6-2, 6-4, 6-4. There are three Tuesday first round matches for US men, with No. 31 seed Jack Sock taking on Australia's Sam Groth, Tim Smyczek playing No. 30 seed Fabio Fognini of Italy and Sam Querrey facing Igor Sijsling of the Netherlands. The draws are here and the order of play for Tuesday is here. 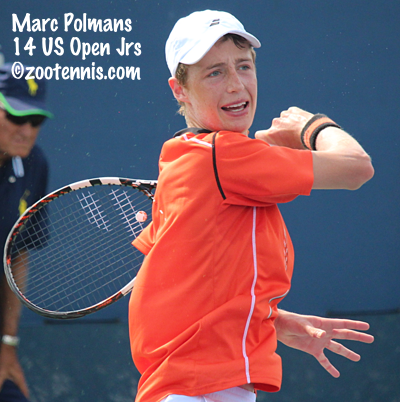 The ITF Grade 1 in Roehampton produced several surprising results in today's second round, with the most notable Australian Marc Polmans' 6-4, 6-3 win over top seed and World No. 1 Taylor Fritz. No. 8 seed William Blumberg fell to Alex De Minaur of Australia 6-3, 3-6, 6-3 and Nathan Ponwith lost to No. 9 seed Yunseong Chung of Korea 6-0, 6-3. But despite those three losses, the US still placed four US boys in the round of 16, with No. 3 seed Michael Mmoh, No. 4 seed Tommy Paul, No. 16 seed Reilly Opelka and Ulises Blanch winning today in straight sets. Polmans dealt Fritz a second loss on Monday in doubles, with he and compatriot Jake Delaney beating Fritz and Mmoh, the top seeds, 6-4, 3-6, 10-7. Paul and Blumberg, the No. 2 seeds, did advance to the second round. Three of the four US girls remaining advanced to the round of 16. No. 16 seed Caroline Dolehide defeated Maia Lumsden of Great Britain 6-2, 7-5 and Kayla Day downed No. 14 seed Pranjala Yadlapalli of India 6-4, 6-3. Ingrid Neel took out No. 10 seed and Australian Open girls champion Tereza Mihalikova of Slovakia 6-3, 3-6, 6-4. Top seed Marketa Vondrousova of the Czech Republic and No. 5 seed Katie Swan of Great Britain are the only seeds remaining in the top half of the draw. In doubles, No. 2 seeds Sonya Kenin and Charlotte Robillard-Millette of Canada lost to Lesedi Jacobs of Namibia and Wushuang Zheng of China 2-6, 6-1, 10-4. In this Player's Tribune post by American tennis great Pete Sampras, he writes a letter to his 16-year-old self, conveying what he wished he had known when he was embarking on his professional tennis career. And in this article by Tom Perotta for the Wall Street Journal, French and Australian Open champion Stan Wawrinka and several high profile coaches make the case for participating in other sports first and concentrating on tennis later. Thanks for sharing some updates from Wimbledon! I always tend to root for the underdogs each time. I have to laugh about that Pete Sampras letter to himself at age 16 in that I can't imagine how little value his "advice" to himself will be to 99.9999% of all other 16 year old tennis players today. First of all, in his book and other documentaries he has admitted that he woke up one day at age 19 and all of a sudden he started serving 140 MPH bombs and that he has no idea how his serve improved so much. So, he can't provide any insight there. I guess if some other teenager happens to get struck by lightning then Pete is offering advice on how to handle the fame and the media attention. I don't think that many people will be "burdened" by this challenge. In that "letter" he also mentions the well known story about how he "met" his wife. This is also a pretty laughable story that again has very little application to 99.999% of most young men. As a multimillionaire athlete, Pete had the privilege of being able to get his agent to "set him up" with a a "cute" actress he saw in a movie. I don't know why he doesn't realize how superficial this story sounds as he really should be embarrassed that he picked out his eventual spouse 100% based on how she looks in a movie, and then used his privileged status to meet her. 99.9999% of all other young men that don't have $20 million dollars and international fame, will have to resort to what normal people do to meet people. On the bright side, hopefully, those more normal meetings will lead to relationships based on more than just physical appearance.